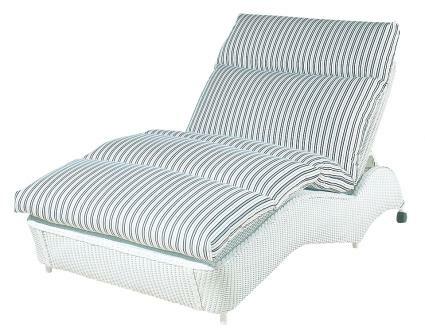 Lloyd Flanders' double chaise invites you to spend a well-deserved afternoon lounging in the sun. Nothing else compares to their luxurious comfort. The double chaise lounge features classic styling inspired by the indulgent seating found on the decks of luxury steam ships. Designed for one or two, Lloyd Flanders' double chaise lounge are perfect for a relaxing nap or a day spent by the pool. Handcrafted to look as pleasing to the eye as they are comfortable to the body, these lounges provide a lifetime of durable dependability and relaxation. With a fully adjustable back and contoured leg support you'll spend hours enjoying tranquil summer days.